Registration: Registration is closed. Sign up for our email newsletter for info on future sessions. This workshop is part of Lynden's Garden Series, a series of workshops throughout the spring and summer of 2017 that take a broad view of what it means to garden. For more information, click here. Join beekeeper Charlie “CharBee” Koenen for a day-long, hands-on workshop designed for those who want to learn how to keep bees. We will begin by meeting the bees and learning who’s who in the hive, then we’ll delve into the history of bees and beekeeping. We’ll look closely at what’s involved in starting up--equipment, installing bees—and will cover important topics like troubleshooting, harvesting, and overwintering. Finally, weather permitting, we'll end up back with the bees, looking inside a nucleus colony for a real hands-on meetup. You will walk away with enough knowledge to start your own hive, an instruction manual, and several handouts. Pack a lunch and dress in light colored slacks and long sleeved shirts. Koenen will supply additional protection as needed. If you have need for an epipen, please bring it. While we don't anticipate a risk of stings, they are not under our control. Koenen will teach polite bee-havior and let you get as close as feels comfortable. 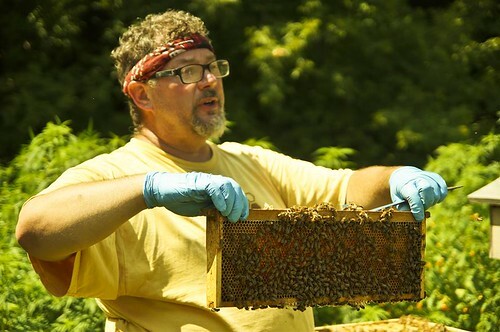 Artist, activist, serial entrepreneur and inventor, and now beekeeper Charlie “CharBee” Koenen has quite a career of cross-pollination. Not satisfied with conventional beekeeping products, the once “Think Different” Apple Authorized businessman started thinking different about bees. Teaming up with another beekeeper, they updated an ancient beehive design and created Beepods, an innovative vented top bar hive. Koenen is the founder of BeeVangelists, a new nonprofit organization with a mission to save the bees by offering programs designed to educate people about bees and how to keep them.